Computed tomography (CT) is a medical imaging method employing tomography. Digital geometry processing is used to generate a three-dimensional image of the inside of an object from a large series of two-dimensional X-ray images taken around a single axis of rotation. The word "tomography" is derived from the Greek tomos (slice) and graphein (to write). Computed tomography was originally known as the "EMI scan" as it was developed at a research branch of EMI, a company best known today for its music and recording business. It was later known as computed axial tomography (CAT or CT scan) and body section röntgenography. CT produces a volume of data which can be manipulated, through a process known as "windowing", in order to demonstrate various bodily structures based on their ability to block the X-ray/Röntgen beam. Although historically the images generated were in the axial or transverse plane, orthogonal to the long axis of the body, modern scanners allow this volume of data to be reformatted in various planes or even as volumetric (3D) representations of structures. 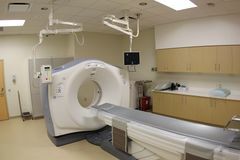 Although most common in medicine, CT is also used in other fields, such as nondestructive materials testing. Another example is the DigiMorph project at the University of Texas at Austin which uses a CT scanner to study biological and paleontological specimens.